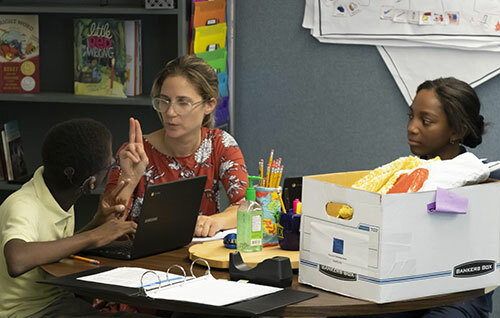 Here at Pennsylvania School for the Deaf, we are committed to providing a quality education for our students and to cultivating a mindful learning environment. Our curriculum, closely aligned with the Pennsylvania Common Core Standards, is vertically and horizontally articulated to address the knowledge, skills and content in each subject area, across all grade levels. Each student has an Individual Education Plan which highlights the specific curricula skills being targeted each year in the student’s program. We use a fully immersive bilingual approach with American Sign Language and English so each student can attain fluency in both languages. Activities and experiences are intended to develop students’ critical thinking, reasoning and problem-solving skills. Effective uses of information technology supplement each student’s education across core academic subjects and through the arts and physical education. We strive to instill in each child a positive body image and a healthy passion for learning and discovery. Community Preschool: 7:30 a.m. to 4:30 p.m. Early Childhood Center: 8:15 a.m. to 2:00 p.m.
Grades 1st through 12th: 8:15 a.m. to 3:00 p.m. In addition to student IEP meetings, phone or in-school conferences should be scheduled during report card times of the 1st and 2nd trimesters. Individual conferences can also be scheduled to accommodate parents who so request. PSD’s instructional program, at its core, promotes the acquisition of learning skills to ensure preparation for life-long learning. This includes aligning curriculum and instruction with Pennsylvania State standards for infants, toddlers, preschool and school age students. Our goal for early childhood education is to prepare children for continued learning and readiness in the school-age program of their choice. First Conversations is committed to the concept that a child’s greatest resource is his/her own family. Our Early Intervention Program partners with families and caregivers to support the development of the whole child. Trained professionals specializing in working with deaf/hard-of-hearing children, visit families in the home and the community to support families’ understanding of various communication opportunities, including American Sign Language and Spoken English, their child’s hearing levels and assistive technology. Our specialized team develops a plan with the family that recognizes each child’s individual needs and utilizes strategies to optimize their child’s communication development. First Conversations Early Intervention staff offer a full range services and supports for families and caregivers. Home Education and Guidance Program: home-based services through regular home visits by fully certified/licensed Teachers of the Deaf/Hard of Hearing, Speech Language Pathologists, and Social Workers. Center-based Family Playgroup: designed for older toddlers, this group meets three times a week and focuses on language learning and routines. Families are supported with strategies to provide their child increased access to communication, language, social and cognitive development. Professional Consultation: infant mental health consultant, psychologist, speech therapist, audiologist, cochlear implant professional and a social worker are available for consult. Parent Workshop Series: monthly guest speakers provide workshops on infant toddler development and behavior, language development and strategies, and community resources. Family American Sign Language Classes: free sign language classes focus on parent communication with their child and learning about the Deaf community. Community Events: play-dates are organized in the community to connect parents of deaf/hard of hearing children with each other and community resources. Anyone who has a concern about a child’s development can make a referral for a multi-disciplinary evaluation to determine eligibility for services. Physicians, social workers, case managers and parents can start the process by calling the City of Philadelphia’s Early Intervention Intake Department at (215) 685-4646. The Community Preschool Program at PSD is located in our Early Childhood Center, on our school campus with access from our Coulter Street entrance. The address for our Early Childhood Center is 143 West Coulter Street in Germantown, Philadelphia. Our play-based program is rich in learning, with emphasis on language development and social skills. We are committed to family-school partnerships and work together in developing and sharing all of PSD’s goals for the children enrolled. The Community Preschool Program is designed for children ages 3-5 who are ready physically, linguistically and socially for an interactive preschool experience. Program Hours are Monday through Friday and closely align our schedule with the PSD School Calendar and the calendar of the School District of Philadelphia. Our program hours are from 7:30 am – 4:30 pm. We offer full-time and part-time programs to meet the needs of busy families. Provide an innovative learning environment for children ages 3-5 which incorporates both American Sign Language (ASL) and English. Provide interaction opportunities with peers for children with hearing loss, including those who are Deaf, Hard of Hearing or use Cochlear Implants in a bilingual environment. 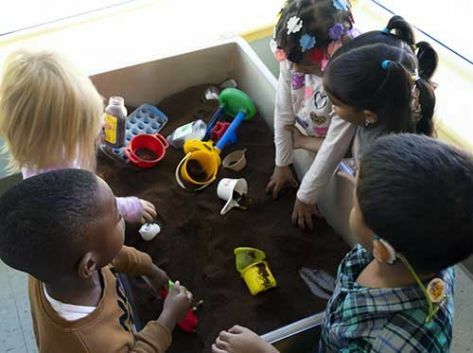 Construct an environment where children laugh, learn and grow through play experiences. Prepare children for entry into public or private Kindergarten programs. Staffed with full-time, fully certified teacher with support from a teacher aide. Small class size (no larger than 15 children) to allow for individual instruction and nurturing. Fresh air is important to learning and growing. We play outside every day (weather permitting)! Students participate in weekly Art and Physical Education classes under the direction of certified specialists. Direct (and indirect) American Sign Language instruction by an ASL specialist (certified teacher). Field trips connected to student learning. Family-teacher conferences twice a year to share stories about growth and learning at home and in school. Family-PSD Partnership with many events (Back to School Night, Fall Fest, Thanksgiving Luncheon, Winter Show, Spring Fling, and others). As children transition from the early childhood program into elementary school, our goal is to help them develop the necessary skills and independence that they will need throughout the rest of their educational journey. PSD provides a strong academic start for the elementary students which will set them off on the right path. Students get to enjoy recess and throughout the week, participate in various “special” classes, such as Physical Education/Health, and Art. Our kindergarten program builds upon the learning and language experiences from the Preschool to Pre-Kindergarten programs. As children transition to Kindergarten, learning experiences become increasingly structured to promote early literacy and learning skills in all curricular areas (mathematics, reading, writing, science and social studies). Interactive experiences promote the continued development of age-appropriate language and communication, academic and social skills. This is when students begin to transition to different classrooms for core academic learning. The adjustment to working with a variety of teachers helps increase and support work habits to prepare students for high school and beyond. These years of consistency, high expectations, and empowerment are the key for our middle school students to achieve both personally and academically. In addition, our strong staff meets the needs of our students and empowers them to make positive choices in their lives. This department serves students Freshman through Senior year while providing ongoing educational and job readiness support for students who exercise the option to stay at PSD through the age of twenty-one. The High School Department’s focus is mainly academic while building upon the social, emotional and practical skills developed in our Early Childhood Education, Elementary and Middle School programs. One important goal of the High School Department is to place students in appropriate internships which provide real life work experience in various careers. These internships are a result of our Future Transitions courses and our partnership with Jewish Employment and Vocational Services (JEVS). Another goal of the High School Department is to prepare our students for post-secondary education which includes colleges and universities or vocational training through Hiram G. Andrews (HGA) by offering ACT testing and connecting students to the Office of Vocational Rehabilitation (OVR) for financial aid assistance. PSD proudly collaborates with Mercy Vocational High School whereby our high school students, with an interest in a particular vocational program, may attend classes to acquire knowledge in a field that PSD is unable to offer them. Students participating in a program at Mercy Vocational High School must commit to all four years with parental permission. There may be fees incorporated with courses offered through Mercy which would be passed on to the PSD student/parents. PSD welcomes all students as valued members of our school community. We provide alternative programming for students with complex needs who require adaptations and supports to meaningfully participate in all areas of academic and social life. These learners may require frequent repetition and breakdown of tasks to learn simple and complex skills. Our instructional programming is developed from the general education content standards provided by the Pennsylvania Department of Education. 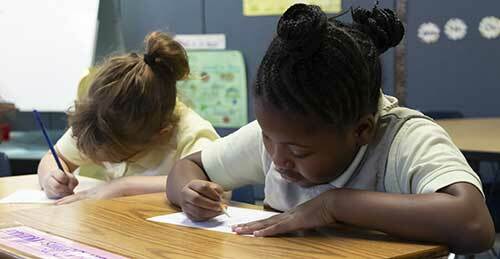 Students with the most significant complex needs receive differentiated instruction using alternative academic content standards for reading math and science. The PASA is given each year to assess progress in alternative academic areas. Our special education classes provide a low student to staff ratio to ensure that our students receive a high level of individual instruction. We collaborate with families to promote generalization and maintenance of across home, school and community environments. Classrooms use consistent behavior interventions that include teaching, modeling and prompting hierarchies. We provide transition services to help students identify educational and career goals and work collaboratively to expand access and opportunities for developing the skills they need to meet those goals. As with our general education students, the goal for our special education students is to work to their highest potential. We work to prepare them for all aspects of life after graduation. Thank you for your interest in The Pennsylvania School for the Deaf! We are a Pre-K to 12th grade school located in the Germantown section of Philadelphia. Approaching the threshold of our 200th anniversary, PSD is the third oldest school for the deaf in the nation. We value and recognize daily our place in history and the responsibility entrusted to us to educate the deaf and hard-of-hearing in our region. Your child will not only be attending a school, he or she will be joining a community and sharing in our legacy. If your son or daughter is admitted to PSD he/she will be attending a school that is committed to providing quality education and enriching life experiences aimed at developing your child to his/her fullest potential. PSD provides a unique language and communication environment for students with educationally significant hearing losses. PSD’s learning environment is accessible through American Sign Language (ASL) and also through spoken English. We serve students whose primary receptive and expressive language for learning is ASL, as well as students whose primary receptive modality for learning is audition and whose primary expressive language is spoken English with sign language support. Prospective students must be referred by their local school district or early intervention agency. While every effort is made to provide programs for children referred for enrollment, there may be some children for whom PSD is not an appropriate program. This includes, but is not limited to, students with severe behavioral or medical health needs and students with severe intellectual disabilities. PSD’s curriculum is responsive to the needs of students, the talents of staff, the changing world in which we live, and the mandates of national/state agendas. Aligned with the Pennsylvania Common Core Standards, our curriculum is vertically and horizontally articulated to address the knowledge/skills and content in each subject area, across the age/grade levels. Each student has an Individual Education Plan (IEP) which reflects the specific curricula skills being targeted each year in the student’s program. PSD also adopted the McGraw-Hill My Math curriculum for grades K-5. This curriculum provides the rigor, personalization, and student engagement students need to be successful with the Common Core State Standards. This re-imagined approach to elementary math is fully aligned with the Common Core State Standards and Mathematical Practices, allowing teachers to focus on inspiring a love of learning. PSD’s Science curriculum is National Geographic science which is a research-based program that is designed to align with state science standards used in grades K-5. Students are immersed in the nature of science inquiry and progresses ranging from observations to designing experiments through the grade levels. Each unit is guided by Big Ideas in Life, Physical, and Earth Science with a focus on both science and content literacy. STEM inquiry is addressed in grades K-5. Students have access to Explore on Your Own and the National Geographic Explorer! leveled informational books for each unit, along with writing and math activities that connect to the science content. Gateway to Science is designed to introduce middle school students to content-area knowledge and skills needed to meet the state requirements for science standards and assessment. Gateway to Science emphasizes content literacy by using vocabulary building pages and textbook formats that allow students to acquire key vocabulary, concepts, and learning strategies. 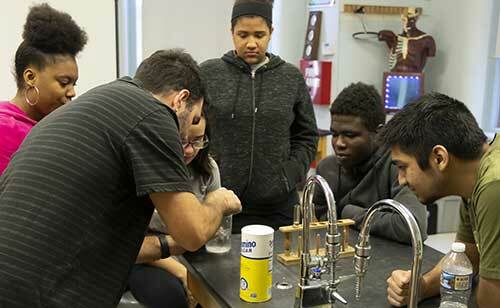 Units focus on Life Science, Physical Science, and Earth Science and provide hands-on opportunities for students to gain scientific understanding through inquiry. Additional adoptions will continue to take place over the next few years. PSD offers its Future Transitions program, which is an exploration and transition preparation program for our high school students. Through structured associations on campus and with outside business and community partners, the program offers students work experiences to assist with career exploration and skill building in preparation for their ultimate walk through post-secondary education, adulthood, work and career. The program includes assessing skills and interests through classroom work and curriculum modules, which include media and financial literacy instruction, and, participating in mentor-ships, internships, shadowing, volunteer activities and community service projects. The classroom also provides the academic supports, and prepares the students to absorb and apply lessons learned from the experiences. Students are matched with on-campus and off campus internships where they are exposed first-hand to work environments and responsibilities. The exposures help guide the students toward careers and fields related to their emerging skills and interests. These involvements are also designed to demonstrate appropriate workplace behaviors, to build communication skills, self-confidence and self-advocacy, and to promote critical and creative thinking; overall, to begin to understand and navigate the work world. This initiative also helps students develop a virtual toolbox of talents and abilities; enables students to broaden their career exploration; and builds confidence and maturity. As well, the program links students and families to educational, community service and agency resources to further promote their continued growth and independence. Deaf students with developmental disabilities (including, cognitive delays, autism, ADHD, etc. ), benefit also from the supportive environment of working in small teams with several PSD staff to develop hard and soft employment skills, prior to participating in individual internships. This pre-trainings can make all of the difference in enabling students who have independence potential to succeed. The Engage Academy’s transition focus is from 3rd grade through graduation with the goal of students with significant disabilities being job-ready for employment within their community at graduation. Career interests explored include teaching, childcare, culinary arts, computer technology, maintenance & housekeeping, photography, art, auto mechanics, office administration/clerical, nursing, dance, and others. Check out this article and video about our program. Our goals are to strengthen their awareness and understanding, and help the students recognize the strengths of their abilities; and not to be, or feel limited by any disability. The program teaches the importance and benefits of a strong work ethic, and how to advance and accomplish ones hopes, dreams and life goals. PSD partners with businesses, the community and agencies to offer internship and mentorship opportunities for the students. Students attend scheduled work experience sessions (weekly and/or monthly) offered by partner organizations. There is no charge to the community partner organization for their participation. PSD provides transportation, student supervision, communication support through a sign language interpreter and lunch for the students as needed.